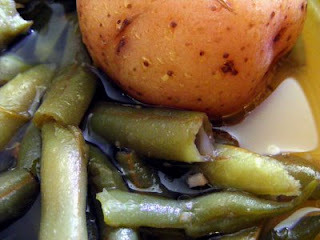 I love green beans with new potatoes and bacon. What combo is any better?? I cannot believe how many green beans my garden has put out this year. I canned like crazy at first and then I saved the last harvest to eat! Weird I know but that is what I do. We eat ours with crispy cornbread and that is it. Nothing else is needed, well maybe some cukes from the garden but that is it. This is What's Cookin on Beaty's Creek today. Place green beans into a large pot and cover with water. Now add bacon and salt and pepper to your tastes. Cook over medium heat for 3 hours, now you will add your new potatoes and cook for another hour. We eat ours with crispy thin cornbread.